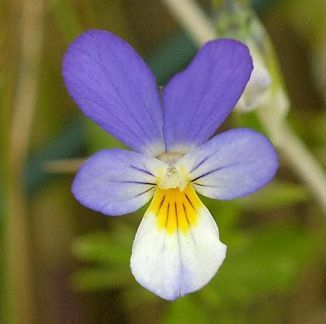 An annual of cultivated fields and sandy, grassy places, this little Pansy has the pretty 5-petalled flowers so commonly known in garden settings, but smaller, more like what are known in gardens as 'Violas'. These flowers (10-25mm across) come in many combinations of yellow, white and violet-blue and are backed with a short spur. They bloom from April to November. The alternate leaves are oval with a heart-shaped base and toothed margin and there are pinnately lobed leaf-like stipules. This is a native plant which belongs to the family Violaceae. My first record of this plant is from Abbey Island, Co Kerry in 1977 and I photographed it at Ballyteigue, Co Wexford in 2007. Also known as Heartsease and Love-in-Idleness, pansies get their name from the French for thoughts, 'Pensées' and from their habit of nodding forward, seeming to be deep in contemplation. 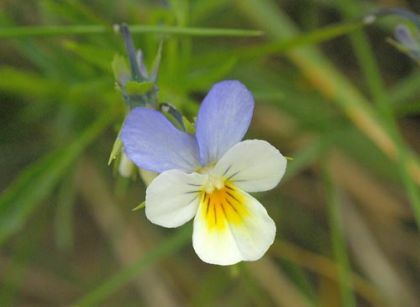 Wild Pansy sometimes hybridises with Field Pansy and Sand Pansy.